Honeybee Pollination! 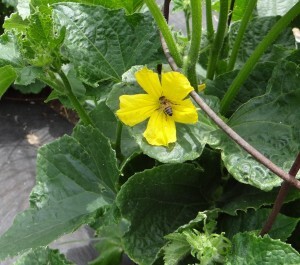 Having honeybees will really help with the pollination of many fruits and vegetables. Pollination is the process of transferring the Pollen from the male part of the flower to the Stigma or female part of the flower, enabling fertilization and reproduction. Some plants have separate male flowers and female flowers; others have male and female structures in the same flower. The size and shape of some types of fruits and vegetables is related to the degree of successful pollination. Sometimes another insect will visit the flower and destroy part of the blossom prohibiting proper pollination. It is a good gardening practice to look at the blossoms to help determine if there are any obstacles to proper pollination.